One of the things I admire most about Chinese food culture is its love of snacks. Chinese people love snacks and it shows. No long travel journey in China would be complete without a plastic bag full of dried noodles, fruit, pickled chicken feet, peanuts, sunflower seeds or processed sausage tubes for eating along with a thermos full of hot water . Don’t forget to bring extra to share with your neighbor or new train friend. If you were really lucky, “Uncle Ganbei” would be on your train – one trouser leg rolled up, belly protruding from under his shirt, glass of baijiu in hand and packet of nuts in the other. He’d be the life and soul of the party…in the sleeper car of the train. Even when not traveling or drinking, Chinese people always have a snack around and are very happy to share it with you whether you wanted it or not. Many a time I have been on the receiving end of such insistent (and in the case of pickled chicken feet, definitely unwanted) snack based diplomacy. Take it from me, it is always best to just cave in and eat whatever is given to you or feign an allergy. As my tastes run to the spicy, I developed a snack preference for fiery peanuts seasoned with Szechuan peppercorns and dried red chiles. This is a snack that can be found practically anywhere in Mainland China but not so much outside the Middle Kingdom. Again, the only option for me was to make these tasty nuts myself and happily, I did. 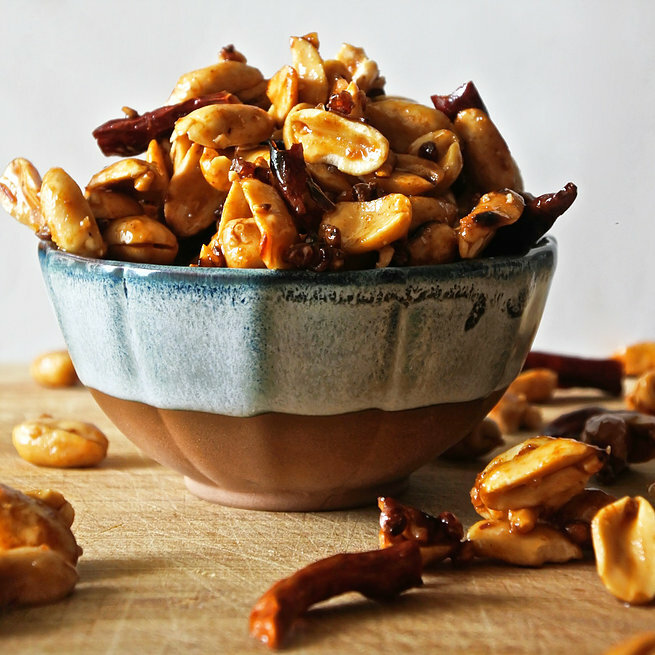 Surprisingly easy to make and with an added touch of honey, these nuts are salty, sweet and spicy delicious. They’re great for parties and general snacking. Uncle Ganbei would approve. Over low-medium heat in a wok or frying pan, toast together dried chiles, Szechuan peppercorns, ginger powder and peanuts for about 5 minutes or until peanuts pick up some color and red chilis have darkened. Add 2 tbsp of honey and toss together until everything is evenly coated. Transfer to a baking sheet and bake in the oven at 175C/350F for 20-30 min or until golden brown. You want the peanuts to have a crunchy coating, so if it is still gooey, cook longer. Make sure to give a stir every 5 minutes or so to prevent burning. Once out of the oven, sprinkle with sea salt and let cool.